This September will see a return to our springtime Thursday night technical workshop series. Whether you’re a D.IY. home mechanic or simply want to have a better understanding of your equipment, these workshops are not to be missed. Places are limited (Max 5 persons per workshop). 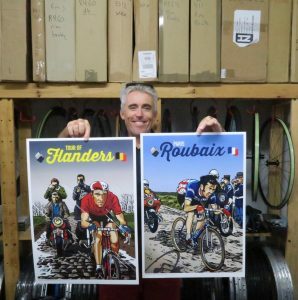 For the third year in a row, Paris-Roubaix will be screened live at The Local Hotel, 282 South Terrace, South Fremantle, on Sunday 8 April from 7pm. For more details check out the facebook event page. 2017 was my 2nd ‘full’ year in business. It had something a make or break feel about it. I worked right through the January New Year’s period knowing that I’d need to take time off with the arrival of my third child. This ended up being quite serendipitous. During this time I was interviewed by the Cycling Maven when I bumped into him on the streets of Fremantle. 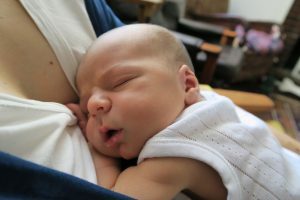 My son Morris Emilsen was born one week early on 15 Jan. In February I found out that my tenancy at the Fremantle Prison would be coming to an end. 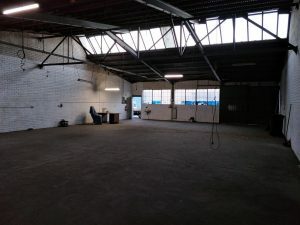 The Business Foundations small business incubator was moving to Pakenham Street, Fremantle and the new location would not be suitable for a workshop-based business. This began a 4 month process of looking for a new workshop. I had countless meetings and inspections, looking for a suitable place. I was hoping to stay in Fremantle but it became fairly clear that this would be unlikely so I started looking further abroad. April saw the return of the European Classics season. There were more live screening events at The Local Hotel in South Fremantle to celebrate The Tour of Flanders and Paris-Roubaix. I am particularly grateful to the three Phil’s: Philip McVey (M3DesignCo), Phil Stevens (Jarrah Records), and Phil Thompson (The Local Hotel) who made running the event such a smooth operation. I am also grateful to the event sponsors Steady Rack, Treadlie Engineering, Pedal Mafia, and Victors Cycle Club who made generous contributions of prizes and cash to get the event off the ground. For the second year in a row, Paul Chartres came through with the goods in helping me manage these two big nights. We made significant improvements in setting up the pub with two screening areas to accommodate a larger crowd. In May things were starting to get very tight when it came to finding a new workshop space. I stubbled across a run-down factory unit in O’Connor that hadn’t been occupied for two years. It had formally been used for manufacturing train components. I considered it a diamond in the rough. The factory unit had an industrial cathedral feel about it with large south facing windows allowing in ample light from the saw-tooth roof. The adjacent neighbours included a furniture maker, metal workers and coffee roasters. 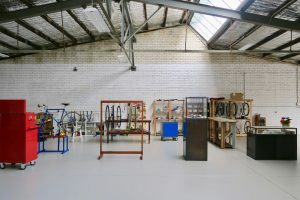 It felt like the right place for a niche craft-focused business on the industrial edge of Fremantle. In July I got the keys to the O’Connor workshop, however it would be another 6 weeks before I could move in. The floors, roof, and electrical wiring were in bad shape and needed to be fixed. I was slightly optimistic in thinking that I could get the roof rebuilt in the middle of a Perth Winter. I kept working at the Prison until I was the last business tenancy to leave. Finally in August I was able to move in and set up shop. Having worked in a 4m x 8m prison cell for the previous 18 months it was a huge relief to be in a larger space. I could now move more than 2m in any direction without bumping into something. Life’s simple pleasures. In August I got to work setting up in the new workshop. I needed some new furniture and ‘storage solutions’ to better display and organize my stock of components, tools, and equipment. I am particularly grateful to Jamie King (Renaissance Man Services), Jordan Crawford (Periodic Furniture Studio) and Patrick Jones who provided immense help in furbishing the new workshop. In September I ran month long series of workshops with the theme of ‘Spring (hub) cleaning’. Professionally, the workshops were a great refresher for me. I started teaching wheel building in 2014 and found that it really helped bring clarity to my work. Teaching forces you to reassess the fundamentals of what you know (and don’t know). The Spring workshops were well attended and it was a good opportunity to invite people to the new workshop. 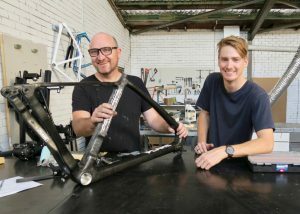 October saw more big changes in the workshop with Matthew and Sam from Plane Frameworks coming to co-locate in the factory unit. Plane Frameworks make carbon fibre frames using a unique foam core manufacturing process that allows for a high degree of customisation. There were clear benefits in having two custom bicycle businesses working in the same space. After several years of working in isolation it has been good to reengage with the world of ‘bike shop’ banter. The number of people at the workshop has continued to grow with Michael from Treadlie Engineering recently joining us. He is working on an innovative bicycle transmission technology project and needed a small workshop space. In terms of ‘the business’, this year has mostly been about consolidation rather than experimentation. Most people are aware of the challenges that face small businesses in the bicycle industry with the dominance of online purchasing, a race to the bottom on price, and a somewhat nefarious system of grey market reselling that has disrupted supply chains. 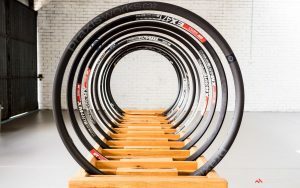 I’ve had a lot of people ask me “why don’t you bring in your own line of hubs and carbon rims?”. So far I’ve strongly resisted becoming another ‘me-too’ wheel business selling ‘branded’ OEM products. While I recognise that large parts of the industry have headed down this road, I’ve always wanted to work with established brands that have genuine innovation and extremely rigorous levels of quality control. Not having my name on my wheel components has given me the freedom to pick and choose. I can be frank and fearless about the advantages and disadvantages that exist between products and to allow customer to make more informed choices. To me this is what custom wheel building is really about. 2017 was an awesome year that disappeared before I knew it. I am particularly grateful to my partner Pia Atahan for supporting me all this time. I am also grateful to David Piggott who motivated me to stay on the bike when I was sleep deprived, grumpy, and exhausted. I’d like to thank my many customers who’ve provided me with friendship and support throughout the year. I couldn’t have done it without you. Wishing you and your families a joyous holiday break. Melody Wheels will be closed from Saturday 23rd December and will reopen on Monday 8th January. Photo credit “A look at the tools pro wheel builders use“, Matt Wikstrom, CyclingTips Nov 2017.